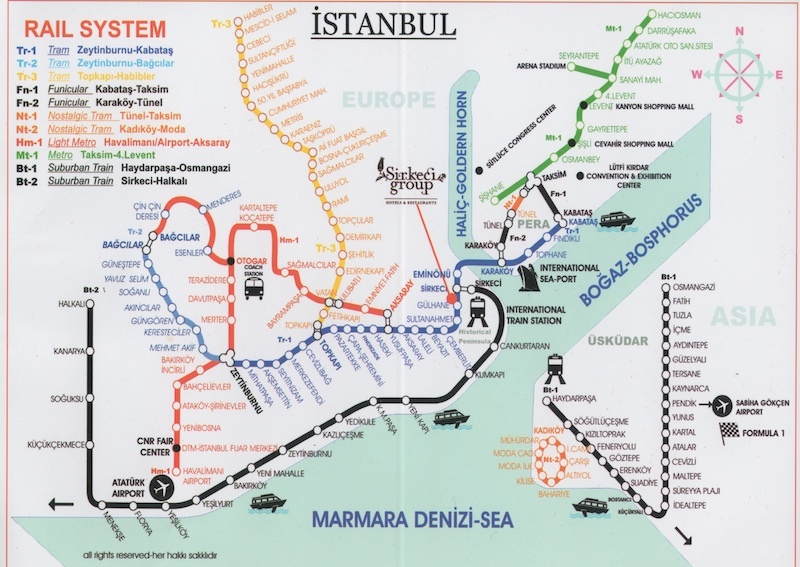 The main modes for transportation are the Metro (for the new parts of Istanbul as well as to / from the airport), the Tram (through the Old City), ferries (mainly for trips between Europe and Asia) and the buses (everywhere). In addition, there are some quirky, only-in-Istanbul options, like minibuses and vans, as well as short connectors (most of which provide an option to ride – not walk – up and down the city’s steep hills). If you will be staying in Istanbul for only a few days, you can use token or electronic ticket, that can be provided from “Jetonmatik” or “Biletmatik” machines in transportation hubs. They accept both banknotes and coins. Alternatively, you can find electronic tickets at the newspaper stands, kiosks and ticket booths near stations, piers and stops. If you will be in Istanbul for more than a couple of days, the easiest thing is to buy an Istanbulkart for payment on virtually all public transportation. It costs only 6 TL. The Istanbulkart is sold at İETT counters near major transportation hubs like Eminönü, Taksim and Beşiktaş. Also it’s widely available at the newspaper stands and kiosks near major transit stops such as Eminönü, Sultanahmet, Sirkeci, Taksim, etc. For the list of private vendors click here. To load money to the card, you can again use İETT counters and private vendors, written “Istanbulkart (or Akbil) Dolum Noktası” on them. All you should do is to give the attendant money with your card and tell how much you want to be loaded. But also you can use Automatic Vending Machines (OSM) in or near transportation hubs. Don’t worry, there is English language option in those. To use your Istanbulkart on the metro or ferry, you place the card on the electronic readers placed on top of the turnstiles. For buses, the reader is next to the driver’s seat. Most of transportation costs 1.95 TL per ride. The first transfer in 2 hours costs 1.25 TL and it decreases gradually by .25 TL until the third transfer. One exception is metrobus which costs 1.60 TL from 1 to 3 stops (but you must press your card to one of the small machines when you get out). Note that you can use your Istanbulkart for more than one person, but the second one costs you two times more. M2 Şişhane-Hacıosman metro line is the fastest way to get Taksim from Şişli/Mecidiyeköy and runs through many of the most populous areas of the European side, including the main business hubs. The full stations are: Şişhane, Taksim, Osmanbey, Şişli/Mecidiyeköy, Gayrettepe, Levent, 4.Levent, Sanayi Mahallesi, İTÜ Ayazağa (in Maslak), Atatürk Oto Sanayi, Daruşşafaka, Hacıosman and Seyrantepe It operates between 5 a.m. and midnight. The M1 Aksaray-Atatürk Airport metro line enables getting to city centre easily from the airport. Finally, the M4 Kadıköy-Kartal metro line connects the Asian-side shore to inner parts of the Anatolian side. Uzunçayır station has a connection with the metrobüs line for an easy transfer to the European side. For full map click here. T1 Kabataş-Bağcılar tram line crosses the Golden Horn and runs through all the main tourist areas in the Old City. For a day of sightseeing, it’s a great way to avoid traffic and rest your legs at the same time. The stations are: Kabataş, Fındıklı, Tophane, Karaköy, Eminönü, Sirkeci, Gülhane, Sultanahmet, Çemberlitaş, Beyazıt, Laleli, Aksaray, Yusufpaşa, Haseki,Fındıkzade, Çapa-Şehremini, Pazartekke, Topkapı, Cevizlibağ-A.Ö.Y, Merkez Efendi, Akşemsettin, Mithatpaşa, Zeytinburnu, Mehmet Akif, Merter Tekstil Sitesi, Güngören, Akıncılar, Soğanlı, Yavuz Selim, Güneştepe, Bağcılar. For map click here. The ferry, one of the symbols of Istanbul, is a great savior from traffic jams when changing continents. You can use it between Beşiktaş-Kadıköy, Beşiktaş-Üsküdar, Eminönü-Üsküdar, Eminönü-Kadıköy and Karaköy-Kadıköy. Frequency for these lines is 30 minutes. For timetable click here. The other line that you might use is Kabataş-Kadıköy-Islands. It costs 3.50 TL for Istanbulkart and 5 TL for token. But if you are thinking of visiting one of the islands on a nice, sunny weekend, try to leave early – after noon the ferries may be too crowded to get on. For timetable click here. Beyond being a traffic savior, the ferries can provide wonderful Bosphorus tours. These include the Full Bosphorus Cruise (25 TL roundtrip), Short Circle Cruise (10 TL roundtrip) and Moonlight Tour (20 TL, only in summer). For timetables of Bosphorus tours click here. For full timetables click here and for map click here. Istanbul has a broad bus network. The majör bus hubs in Istanbul are Kabataş and Taksim on European side and Kadıköy on Asian side. The number of the bus and the main districts that it passes through are written on the signboard next to the front door. Do not forget to check it before you get on. You can search for the buses here. And for İETT’s trip planning system click here. For very useful tips about buses click here. Metrobüs, used widely, is actually a new transport. It was introduced to ease the route between continents, and it sure did although it is too crowded in rush hours. 34Z works between Zincirlikuyu and Söğütlüçeşme (Kadıköy). 34 metrobüs line is also important for its connections to M1A, T1 and T4. Motorboats are faster than the ferry and work continuously. They are found under “Dentur” or “Turyol” signs and run between Üsküdar-Beşiktaş, Üsküdar-Kabataş, Üsküdar-Eminönü-Karaköy, Kadıköy-Eminönü-Karaköy, Eminönü-Karaköy and Eminönü-Bebek. For timetable of Dentur click here. For timetable of Turyol click here. There are also motors to Islands (Adalar) which cost 5 TL. They can be an alternative if you miss the ferry to return or prefer a fast travel unlike the ferry that stops at all the islands. For timetable of Dentur click here and for timetable of Turyol click here. The Bosphorus tours with a motorboat are much cheaper than with the ferry. Long Bosphorus Tour costs 15 TL for roundtrip and takes 5.5 hours including 3 hours accomondation in Anadolu Kavağı, a lovely fishing town. Departure from Kabataş is at 11.15 a.m. and from Beşiktaş is at 11.30 a.m. Hop On-Hop Off Tour takes 1.5 hours and costs 12.5 for roundtrip and include a free guide service. For timetable click here. Taksim-Kabataş funicular line is important for connecting metro (M2) with the tram (T1). It is the easiest way to get Taksim from Kabataş and runs every 5 minutes. You can get to Kabataş funicular station from 4 different places: İDO Kabataş Seaport, Kabataş bus stations, T1 tram line’s Kabataş stop and Kabataş-Setüstü. The Taksim funicular station is inside the Taksim metro station. This tram, which is a restoration of old trolleys from the early 20th century, has become the symbol of İstiklal Avenue. The Beyoğlu nostalgic tram works between Taksim and Tunel. Frequency is about every 20 minutes, and hours are: In weekdays and Saturday: 7 a.m. – 10.45 p.m. Sunday: 7.30 a.m. – 10.45 p.m.
You are treated to a small Kadıköy tour while traveling to Moda on this tram. The stations are: İDO- İskele Camii- Çarşı- Altıyol- Bahariye- Kilise- Moda İlkokulu-Moda Caddesi- Mühürdar- Damga Sokak Frequency is every 15 minutes. The most famous connects Eyüp and Pierre Loti, where you can drink a nice cup of tea looking at beautiful Golden Horn. For rail system map click here and for a good guide on rail system click here. You can see these blue vehicles almost everywhere! For most of the time they follow the same route with the buses but they are preferred for being faster than them. They stop when you wave your hand. You have to ask the driver how much does it cost to the place that you want to go to. If you do not want to ask, just give him 5 TL. These yellow vehicles have their routes listed in the front window. Their name literally means “stuffed” in Turkish, and they leave when the vehicle is full, allowing passengers on and off anywhere along the route. The most well-known runs between Kadıköy and Taksim costs 6 TL, and runs all night. In Istanbul the most problematic transport is taxi, but they are ubiquitous and relatively cheap. Sadly, many taxi drivers try to trick tourists about the cost of travel. 1. Ask how much would it cost before you get in. 2. Make sure the driver starts the taximeter. 3. Look at the amount written on the taximeter before you pay an amount the driver says. There are taxi stations in most neighborhoods, but they all have their own number. So, waving your hand to stop a taxi is still the most common way to flag one in Istanbul. The taxi fare between Taksim and Sultanahmet should be about 11 TL. Do you think this article is useful? Comment and share your opinion with others!